At first, the grains of rice that Ingo Potrykus sifted through his fingers did not seem at all special, but that was because they were still encased in their dark, crinkly husks. Once those drab coverings were stripped away and the interiors polished to a glossy sheen, Potrykus and his colleagues would behold the seeds' golden secret. At their core, these grains were not pearly white, as ordinary rice is, but a very pale yellow--courtesy of beta-carotene, the nutrient that serves as a building block for vitamin A.
Potrykus was elated. 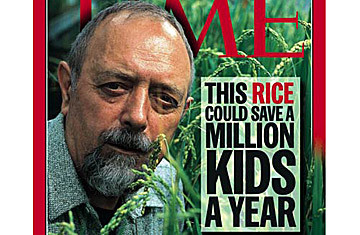 For more than a decade he had dreamed of creating such a rice: a golden rice that would improve the lives of millions of the poorest people in the world. He'd visualized peasant farmers wading into paddies to set out the tender seedlings and winnowing the grain at harvest time in handwoven baskets. He'd pictured small children consuming the golden gruel their mothers would make, knowing that it would sharpen their eyesight and strengthen their resistance to infectious diseases. And he saw his rice as the first modest start of a new green revolution, in which ancient food crops would acquire all manner of useful properties: bananas that wouldn't rot on the way to market; corn that could supply its own fertilizer; wheat that could thrive in drought-ridden soil. But imagining a golden rice, Potrykus soon found, was one thing and bringing one into existence quite another. Year after year, he and his colleagues ran into one unexpected obstacle after another, beginning with the finicky growing habits of the rice they transplanted to a greenhouse near the foothills of the Swiss Alps. When success finally came, in the spring of 1999, Potrykus was 65 and about to retire as a full professor at the Swiss Federal Institute of Technology in Zurich. At that point, he tackled an even more formidable challenge. Having created golden rice, Potrykus wanted to make sure it reached those for whom it was intended: malnourished children of the developing world. And that, he knew, was not likely to be easy. Why? Because in addition to a full complement of genes from Oryza sativa--the Latin name for the most commonly consumed species of rice--the golden grains also contained snippets of DNA borrowed from bacteria and daffodils. It was what some would call Frankenfood, a product of genetic engineering. As such, it was entangled in a web of hopes and fears and political baggage, not to mention a fistful of ironclad patents. For about a year now--ever since Potrykus and his chief collaborator, Peter Beyer of the University of Freiburg in Germany, announced their achievement--their golden grain has illuminated an increasingly polarized public debate. At issue is the question of what genetically engineered crops represent. Are they, as their proponents argue, a technological leap forward that will bestow incalculable benefits on the world and its people? Or do they represent a perilous step down a slippery slope that will lead to ecological and agricultural ruin? Is genetic engineering just a more efficient way to do the business of conventional crossbreeding? Or does the ability to mix the genes of any species--even plants and animals--give man more power than he should have?